How does a major seawater warming event (2015-2016 El Niño) affect coral partnerships? I am currently studying how local and global impacts affect coral partnerships during the 2015-2016 major El Niño event. Corals partner with single-celled algae that live inside the coral tissue, which act like solar panels to power coral growth. When ocean temperatures warm up, these symbiotic partnerships can break down, causing coral bleaching and/or mortality. The 2015-2016 El Niño event allows us to understand how coral partnerships change when water temperatures increase over the course of a year. Stay tuned for this manuscript - coming soon! In a related opinion piece in Coral Reefs, Julia Baum and I argue that, for coral bleaching surveys, "Timing Matters". 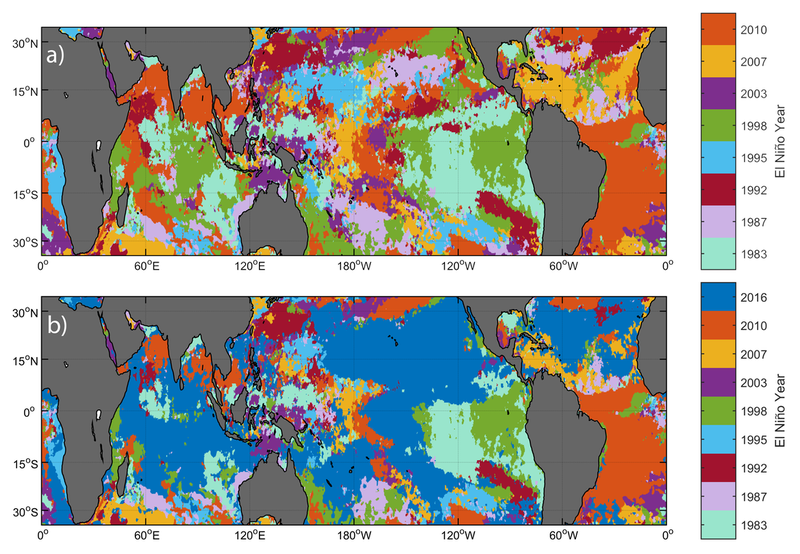 Specifically, we address changes in the length and intensity of recent coral bleaching events, and provide a conceptual framework and a specific example of how survey timing influences our perception of coral resilience. If survey timing is not considered during coral bleaching events, researchers may draw false conclusions and results regarding bleaching susceptibility, coral species-specific resistance, and resilience capacity. We provide recommendations for avoiding these potential pitfalls. How do local human impacts affect the relationship between coral and their microbial symbionts? The relationship between coral and their microbial symbionts (including both symbiotic algae and bacteria) is important because it can provide insight into the history of coral bleaching, and indicate the overall health of coral. My current focus is to evaluate the dynamics of coral symbioses on the world’s largest atoll, Kiritimati (Christmas Island). Our goal is to better understand how the diversity and prevalence of coral symbionts varies over a large-scale anthropogenic impact gradient, and how these relationships tie into our current understanding of reef resilience. Two manuscripts from this research are currently in progress/review. 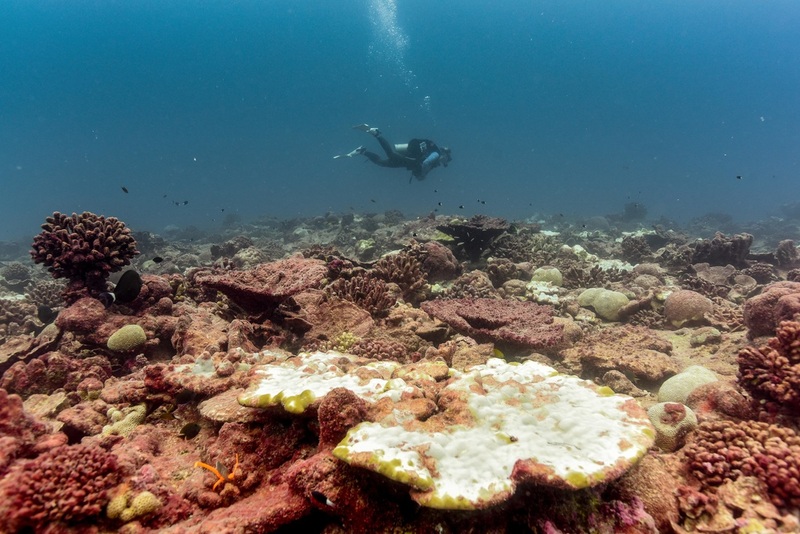 Despite reports of extensive coral bleaching and up to 97% coral mortality during El Niño warming events, a quantitative synthesis of these events was lacking from the literature. To address this gap, we conducted a global meta-analysis of coral bleaching and mortality during El Niño. We are also in the process of developing an accessible coral heat stress product (interactive version under construction, v2 release anticipated in mid-2019). This study, lead by Maryann Watson, sought to assess how people with very high reef dependence perceive and adapt to changes in their fisheries resources. See our Oceans and Coastal Management paper here, or check out our AudioSlides presentation here. How dynamic is coral health? For this project, we repetitively monitored coral colonies on the Big Island of Hawai'i in order to determine dynamics of reduced health states (such as coral bleaching, disease, algal overgrowth) at the colony scale. For a 3-D, interactive underwater virtual tour of our study site, see here. (Montipora capitata) to algal overgrowth at Wai‘ōpae, Hawai‘i. How does temperature affect both the numbers and types of creatures that live along the shoreline? How do we determine the status of fish populations that we know little about? I participated in the NMFS RTR Program and conducted a preliminary stock assessment of the tomtate (Haemulon aurolineatum). This report became part of a collaborative NOAA Technical Memo assessing 4 data-poor stocks in the U.S. South Atlantic. Life on the Docks: How do sea squirts affect real estate and growth of their underwater neighbours? Fouling communities, the groups of organisms that grow on docks and other human-built structures, are composed of sea squirts (tunicates), bryozoans (moss animals), and many other invertebrates. These communities provide an ideal model system to understand ecological interaction mechanisms. For this project I studied tradeoffs of mutualism and competition in sessile fouling community invertebrates with the UC Davis Bodega Marine Laboratory, see our publication here.